Madre Chocolate, based in part in Kailua, announced today that it has won the World Silver Medal for their Triple Cacao bar in the International Chocolate Awards in England. Madre was one of only four American companies to win world final medals, and the youngest company to win. Madre Chocolates is only two years old. 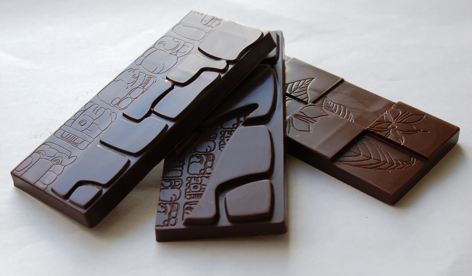 This same bar had recently won the US Gold medal and Americas Silver medal in the International Chocolate Awards flavored dark chocolate category and the NW Chocolate Festival Inclusions Silver medal. The Triple Cacao bar is the only bar in the world that incorporates the tangy, lychee-tasting fruit of the cacao pod as well as nutty, crunchy nibs and smooth, rich dark chocolate to give you a taste of three flavors and textures all from cacao. This bar, and Madre’s full line up of Hawaiian and Latin American chocolates, are showing the world that we can make world-class chocolate right here in Hawaii creating a great market for the new but rapidly growing cacao crop in the Islands. Madre Chocolate’s cofounders David Elliott and Nat Bletter said they were elated and proud of the worldwide recognition of their hard work and social mission to support cacao growing communities throughout the tropics, but only rested briefly to relish the award from the lengthy work of selecting, sorting, roasting, cracking, winnowing, grinding, tempering, and wrapping their chocolate from cacao bean to bar. “We’ve got to get back to making more of these delicious bars to meet the imminent surge in demand locally and from halfway across the globe,” said Madre flavormeister Bletter, and then returned to his task of making sure each cacao nib for the Triple Cacao bar was exactly 1.5 mm wide with a digital caliper and a quadriflux confocal laser microscope. Elliott, Madre’s expert chocolate maker, could not give further comment as he was already off in a cloud of cocoa powder to conche another batch of chocolate for this award-winning bar. Madre Chocolate bars, bean-to-bar chocolate making kits, and Cinnamon Daddy Mactella are available in their online store, and in stores throughout Hawaii, the US mainland, and across Europe in Belgium, Holland, Germany, and Sweden. Submitted by Nat Bletter of Madre Chocolate.